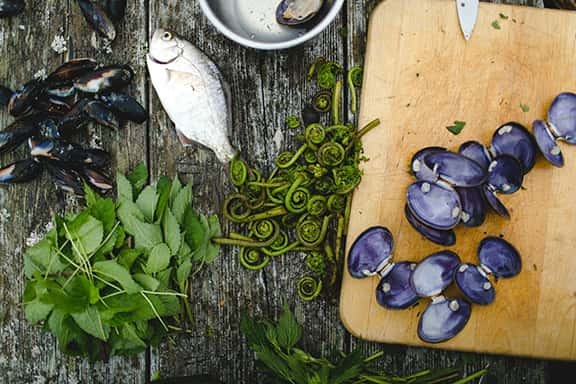 This class will introduce students to clamming, and foraging edible wild plants that grow close to the ocean and bays. The group will gather clams in the mud flats of Nehalem Bay, and take a short hike to identify and gather different species of edible or medicinal plants that thrive in the salty coastal environment. If time allows, the group will travel to another location to harvest a few other clam species and sand shrimp. This workshop will be structured around principles of ethical harvest, as Henry shares information about the coastal ecology, ethnobotany and history of the area. Students will also learn how to process and preserve the wild foods found during the workshop, with a bonus cooking session and group meal at the end of class. This workshop will be held in Nehalem Bay, Oregon, and requires a reasonable level of physical fitness, and the abilty to be outside in potentially inclement weather. Class will be running, rain or shine. Please leave dogs at home.